Here are the results of yesterday's analysis of competence development. The cultures were kept at low density by repeatedly diluting them 10-15-fold in fresh medium. For each medium type, the second sample was taken 70 minutes after the first, and the third sample was taken 95-125 minutes after the second. Each culture was then diluted twofold into fresh medium with and without cAMP, and the last two samples (with and without added cAMP) were taken after an additional 50 minutes. 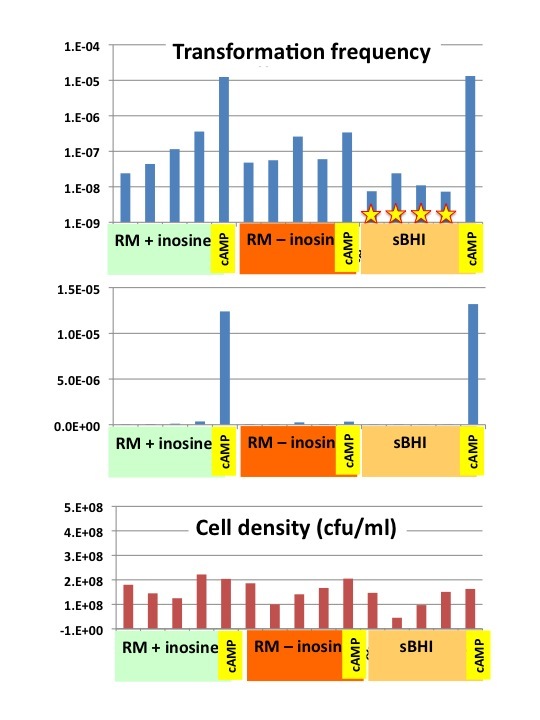 The bottom graph (red bars) shows that cell densities were kept fairly constant by the dilutions (one sBHI sample had lower density than I expected). 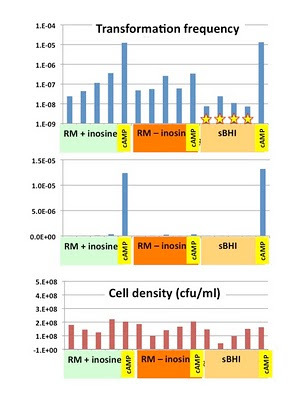 The upper graph shows transformation frequencies on a log scale; the stars are there to indicate that the bars for cells in sBHI represent upper limits as there were no transformed colonies. The middle graph shows the same data on a linear scale to emphasize that cAMP induced competence in RM + inosine just as well as it does in sBHI, but didn't induce competence at all in RM - inosine. This clean result agrees with one of my previous observations, that log-phase cells in RM are more competent than log-phase cells in BHI, but unfortunately disagrees with another, that cAMP doesn't significantly induce competence in RM + inosine. So I'd better repeat this experiment tomorrow. I'll try to keep the cell densities more constant by making more frequent and smaller dilutions, and I'll plate larger volumes so the transformation estimates are more precise (many of them are based on less than 10 colonies). Luckily I now have plenty of clean glassware.